7 p.m. “The Working Class and the Road to Power”, a presentation by John Riddell, drawing on his books on the Communist International, including the latest, which he co-edited, “To the Masses”. Barry Weisleder, co-editor of Socialist Action newspaper, will contribute as a ‘discussant’ on the panel. 10 a.m. “Theories of Underdevelopment – What Path to Prosperity for the Poor Countries?”, with Yasin Kaya, PhD. candidate in Political Science, York University. 1 p.m. “What’s Wrong with Identity Politics?”, talks by John Wilson, a Socialist Action leader and a pioneer of the gay liberation movement in Ontario; Cherie MacDonald, long time pro-choice activist; and Nick Mule, founder of Queer Ontario, and associate professor in the School of Social Work, York U. 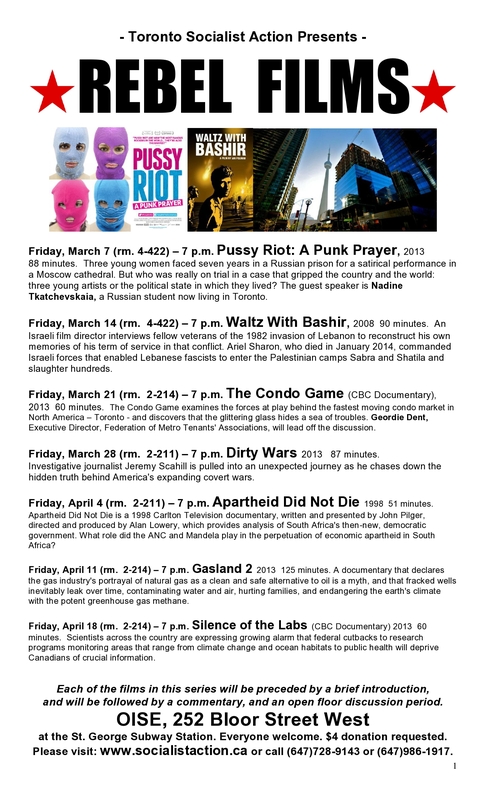 4 p.m. “Is Climate Justice Possible?”, with Robbie Mahood, a leader of SA/LAS based in Montreal. There may be an additional speaker, t.b.a. MASS PICKET!!! DEFEND THE POSTAL SERVICE! 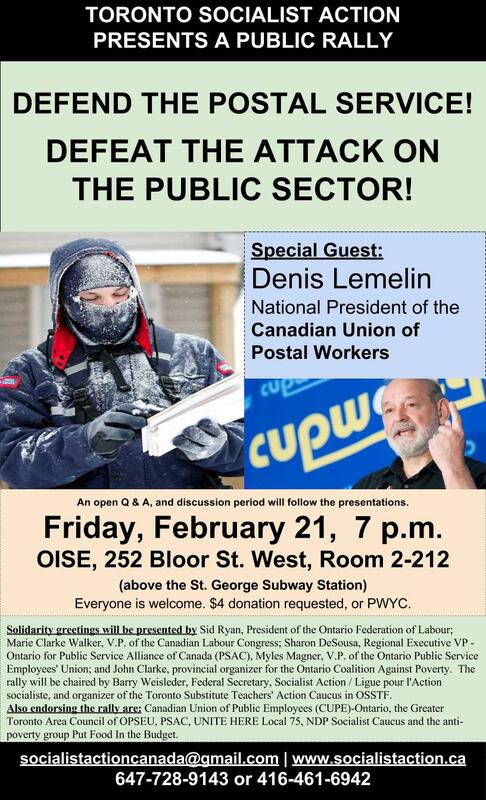 *UPDATE: Below is the video showing the picket and rally held recently to defend Canada’s postal service. 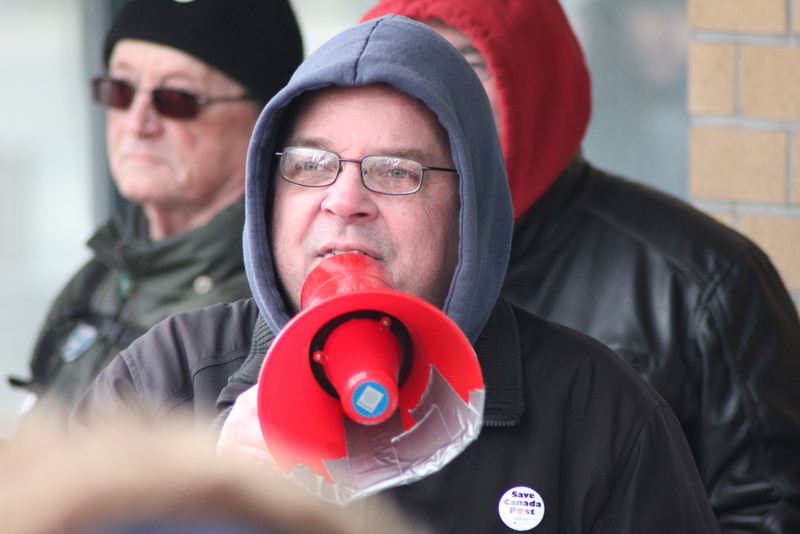 Members of more than a dozen labour unions, political parties and community groups rallied to demand that Canada Post Corporation and the Conservative federal government of Stephen Harper reverse the decision to phase out home mail delivery to over 5 million addresses, and refrain from increasing the price of postage. 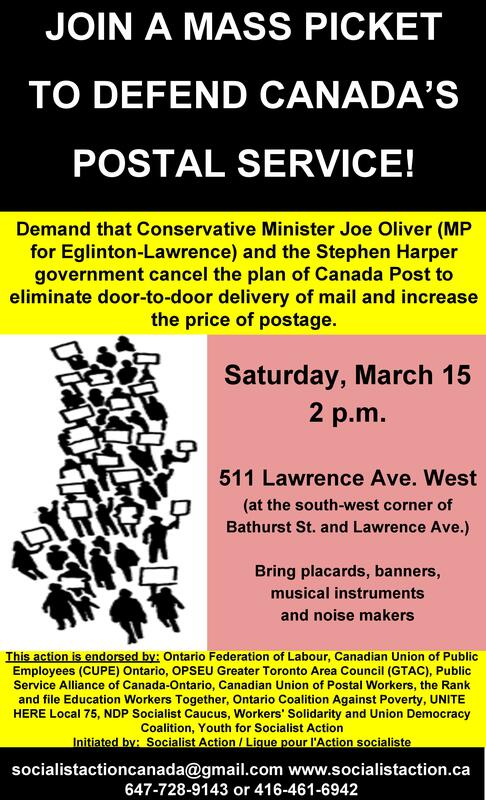 Protest against the plan to terminate door to door mail delivery hit Toronto streets and the mass media on Saturday afternoon, March 15. 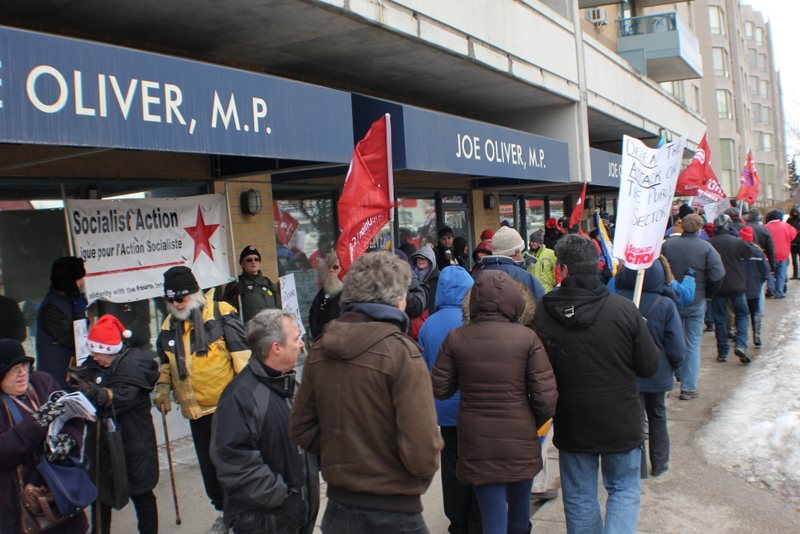 Close to one hundred people answered the call of Socialist Action and braved freezing high winds to picket the constituency office of Conservative Minister of Natural Resources Joe Oliver, located at Lawrence Ave. and Bathurst St., a busy uptown intersection. 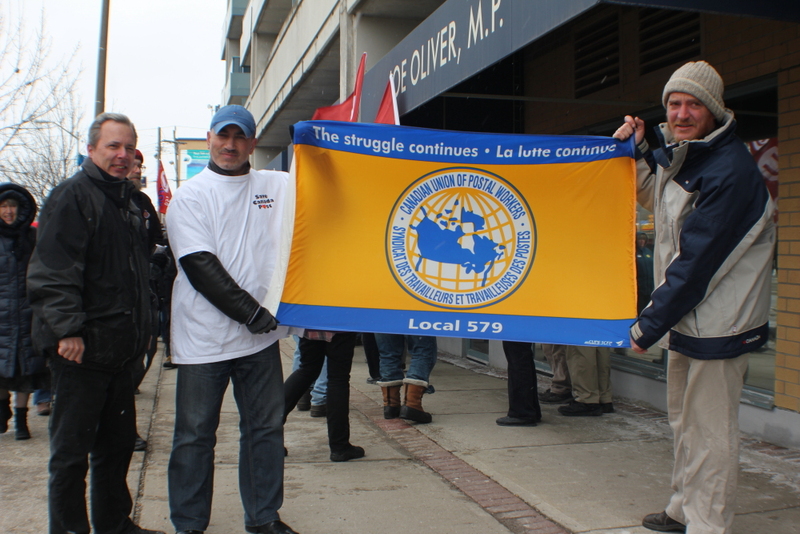 Demonstrators walked in an oblong loop on the sidewalk next to the MP’s office entrance and chanted: Stop the Cuts at Canada Post, Save Letter Carrier Jobs, No Cuts No Price Hikes – Defend Postal Services, and Seniors Demand Home Mail Delivery. 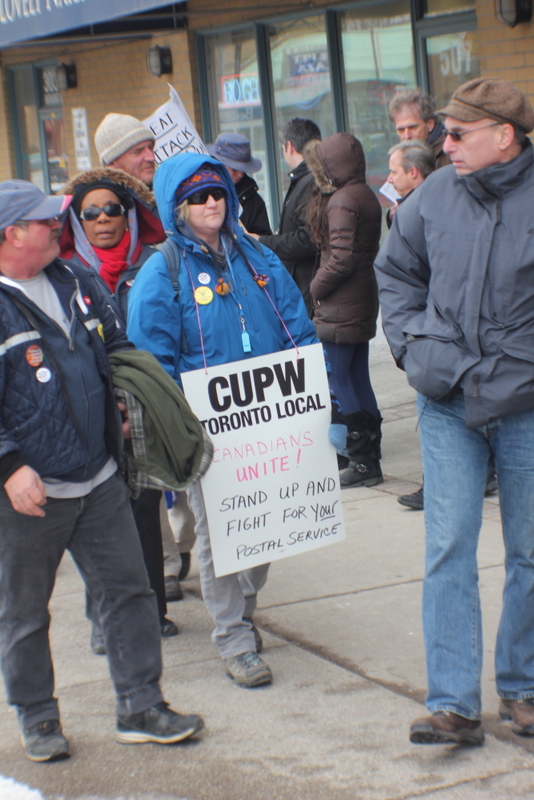 About one quarter of the crowd appeared to be members of the Toronto Local of the Canadian Union of Postal Workers (CUPW). 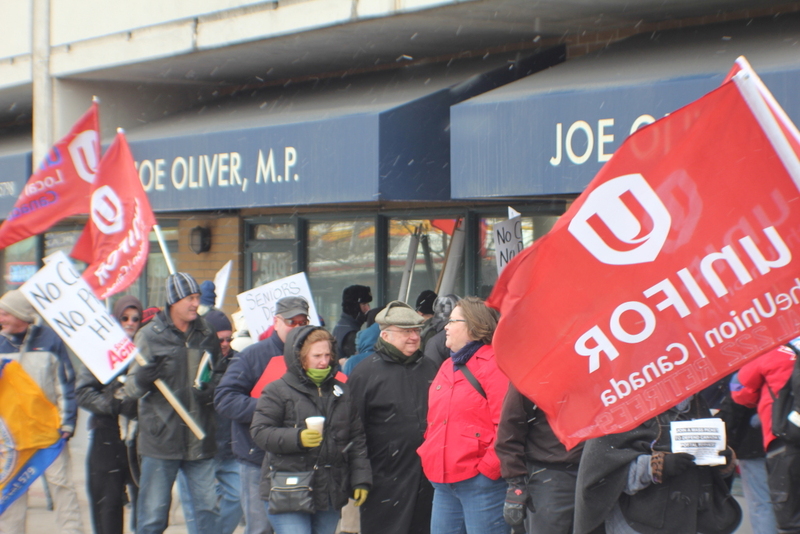 The rest identified as partisans of UNIFOR, UNITE HERE, OPSEU, CUPE, secondary school teachers, and a host of local groups including Put Food in the Budget and the United Jewish People’s Order. Placards signed by Socialist Action, plus a large SA banner were highly visible on the street, and in the TV coverage of the event broadcast by CBC, CTV, CITY-TV, OMNI-TV and CP24. Participants sported buttons ‘Save Canada Post’ distributed by CUPW, and bought 13 bright yellow buttons produced by SA bearing the slogan ‘Capitalism is Organized Crime’. 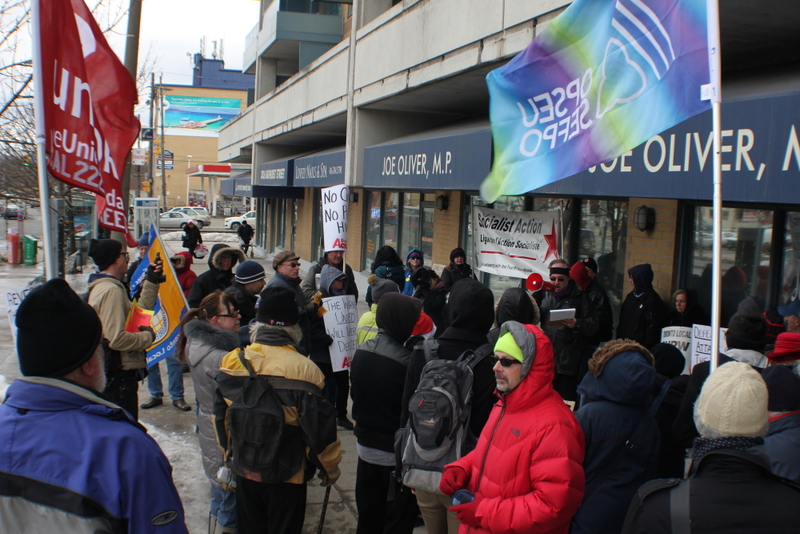 Representatives from OPSEU, UNIFOR, PFIB, the NDP Socialist Caucus, UJPO and Youth for Socialist Action also addressed the shivering crowd. Weisleder, two days earlier, submitted a written application for a meeting with MP Joe Oliver. Should the request be granted, organizers would like all the groups involved in the Saturday protest to send a rep to that close encounter with the Tory MP for Eglinton-Lawrence. PUBLIC RALLY! DEFEND THE POSTAL SERVICE! 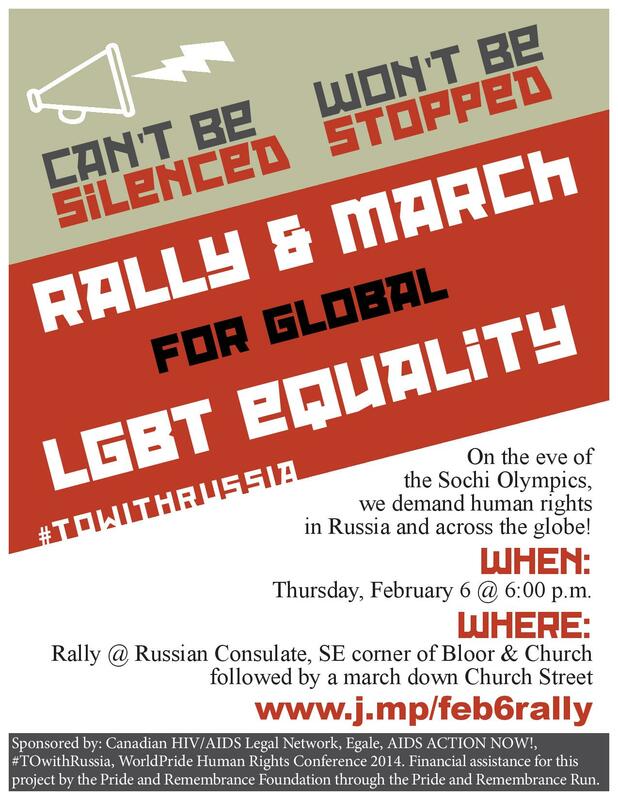 Rally and March for Global LGBT Equality!